Nick Jankel, bestselling author, professional keynote speaker, well-known entrepreneur, agony uncle on BBC Radio, and the only wisdom teacher we know to advise the UK Prime Minister. He can inspire your audience with his cutting-edge Millenial ideas on empowerment and leadership – and engage them with his playful and warm manner as he shares big ideas in purposefully accessible ways. Spiritual Atheist, has been the No.1 Hot New Release in Philosophy on Amazon! A Cambridge-educated scientist and medic, Nick was unable to find lasting happiness with either religion or reason (nor through pills, therapy, partying, wealth, success, or entrepreneurship either). He was depressed and diagnosed with Fibromyalgia. Even though he was, and or still is, a militant atheist, he finally discovered the life-changing benefits of ‘spiritual’ enlightenment. But allergic to easy New Age platitudes, he has spent years meticulously joining the dots between the scientific traditions and the wisdom traditions to form a practical life philosophy for the 25% who say they are ‘spiritual but not religious’. Nick has used his ideas to heal himself, become profoundly happy and purposeful,, as well as coach thousands of others – including as a host on two network TV shows (BBC and MTV coaching a major celebrity). His top tips for a better life have appeared in the Daily Mail, Hay House Radio, CBS, Cosmopolitan, and many more. 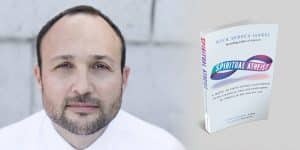 Nick’s book illustrates that we can only truly help ourselves and thrive heal ourselves from all mental suffering – depression, anxiety, addictions, trauma – by harnessing both scientific facts & ‘spiritual’ insights. The book is very controversial because Nick challenges New Age ideology as much as scientific orthodoxy. Nick states clearly that being genuinely spiritual has little to do with New Age clothes and lifestyle choices. He also challenges the pernicious “pick and mix” culture of contemporary spirituality that so easily avoids the real difficulties of self-transformation. The book also covers the benefits and risks of psychedelics and medicine plants, raving and festival culture, spiritual materialism, and much more.